As the Olympic Torch arrived today in Krasnodar, Russia, the capitol city of Krasnodar Region of Russia, the police were busy detaining peaceful environmental activists from Environmental Watch on the North Caucasus (EWNC). On Monday the 3rd and Tuesday the 4th of February, the police detained seven members of the organization. All but one were released yesterday, but Evgeniy Vitishko, who was wrongfully arrested and sentenced to a three year suspended sentence in 2012, was re-arrested as he awaited the appeal of his trial on February 22nd. Accused of hooliganism at a public bus stop, the 51-year old activist was arrested and sentenced to 15 days in jail, a clear sign from the authorities that those who speak out against the environmental damage caused by the Olympics in Sochi will be punished. 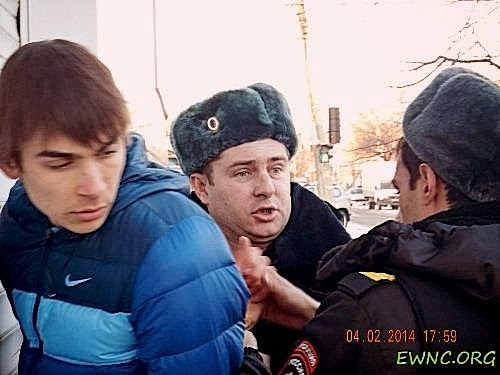 Today, in a separate incident, Igor Kharchenko of EWNC, was arrested again by the police after his car was vandalized. When he and other members of EWNC approached the car, police handcuffed him, took him into custody and charged him with disobeying a police officer. He will spend tonight in jail. EWNC is one of the few environmental groups in Russia to speak out openly against the numerous environmental and human rights problems associated with the Olympic games—destruction of old growth forests, devastation of homes of local residents, and numerous other violations. EWNC has not only monitored the preparation for the Olympics, but also monitors and protects environmentally fragile areas throughout the North Caucasus, and has identified numerous areas where oil and gas companies drill in protected areas, public officials flagrantly violate environmental law for their personal benefit, and international conventions including those to protect endangered species, migratory birds, and world heritage sites are ignored by the Russian authorities and the international institutions designed to protect them. The events of the past week are related to the Olympic Games. The Russian authorities are doing everything they can to subdue the voices of peaceful protest. And, rather than demonstrating their “might,” the authorities are demonstrating the power of the voices of truth, actions of non-violent protest, and the spirit of those who stand up to authority. Environmental Watch on the North Caucasus and all those who speak the truth in these dark days deserve our support and our solidarity.